Hilda is sat in her tent, dwarfed by volumes of the Greater Fjords Wildlife Chronicles with a flashlight and her restless companion Twig, but Hilda's not in the fjords and it isn't raining. Hilda's pitched a tent in her room and it's been days since she's been out. In Hilda's new adventure, she meets the Nisse: a mischievous but charismatic bunch of misfits who occupy a world beside—but also somehow within—our own, and where the rules of physics don't quite match up. Meanwhile, on the streets of Trolberg, a dark specter looms . 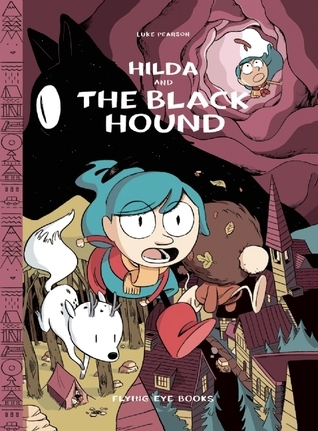 . .
Hilda and the Black Hound was one of the prettiest graphic novels I have opened in a while. I think I petted for a long time (and smelled it) before cracking it open. I love Hilda’s character design and I will have to hunt down the other books in this series to learn more about her. I like that this graphic novel can stand on its own. I haven’t read any of the other Hilda books, but I fell into the story just fine. One of the most charming parts of the book were the Nisses and their characteristics and ways. I love when there are paranormal creatures from other cultures that are not often seen in graphic novels. You get a little sick of werewolves, ghosts and vampires after all. I loved the pace of the book, the characters, the ease in which magic fit into the world and most of all Hilda. I always have admired blue hair and had some of my own when in high school. Hilda charmed me, I loved her character and the way that she just decided to help the Nisses even though she did not have to. The hound was a surprising twist at the end and one I did not see coming, I guess I wasn’t sure how scary this book would get and have to say it is safe for younger readers. I’m definitely going to look into getting this series for my own school library. A beautifully drawn and written graphic novel, with a strong female heroine and a story to keep you enthralled.